The headline above comes from a June 22, 2015, feature article in the Minnesota Star Tribune. The article looks at several children who have had their lives improved by going to a chiropractor. The article begins by saying, "Concerned about the frequent use of antibiotics, some parents are seeking chiropractic care for everything from stomachaches to runny noses." The discussion about children needing chiropractic is a polarizing one. Many people believe very strongly that chiropractic care is essential for young spines while others do not. Kimberly is the mother of Tobias, an active one-year-old boy featured in the article who is a new chiropractic patient. "We knew that as our children were growing that we would seek chiropractic care as they had growing pains and accidents," she explains. Noting how active her son is, she added, "And Tobias, he's a mover and a shaker." Tobias's chiropractor, Dr. Anne, explained that for many babies, the only way they can communicate something is wrong to their parents is by crying. "For an infant, their only way to tell a parent they don't feel good is by crying." She points out that this may not be just the result of being hungry or tired or wet, but may well be the result of a health issue that stems from a spinal misalignment, known as a subluxation. Dr. Anne also explained the uniqueness of the process of adjusting a baby or small child. "With a 2-year-old, you’ve got about 20 seconds to get it done because they're either yelling at you or want to be done. It's hard to describe to a young kid what they’re going to feel," she said. "So I always have them near Mom and Dad so that they’re not afraid." The U.S. Centers for Disease Control and Prevention state that in 2012, about 3.1 percent of children in the U.S. were seen by chiropractors. Dr. Elise Hewitt, president of the pediatrics council for the American Chiropractic Association added, "That’s a total of almost 2 million children in 2012 that received chiropractic and osteopathic care." 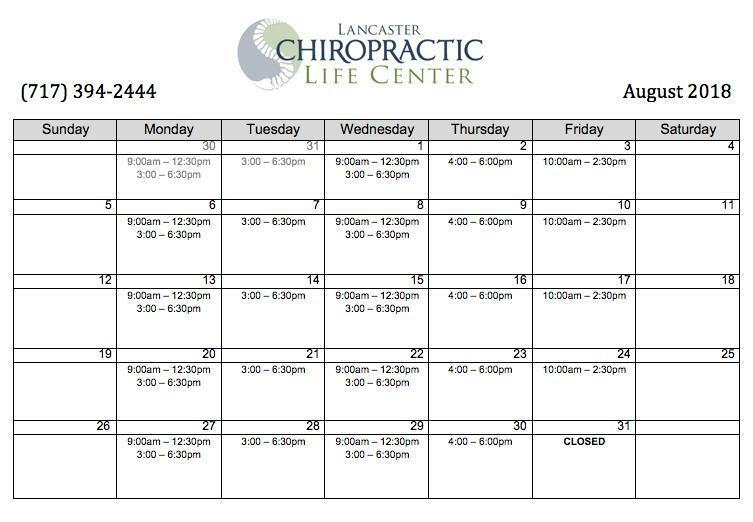 In explaining the typical scenario of why a parent brings their child to see a chiropractor, Dr. Anne said, "So parents get frustrated. They've been at the pediatrician for two or three months and their kid has been on three or four antibiotics," she said. "More often than not, it's a structural thing that's causing the ear infections. So they end up here." To explain her reasons for bringing her kids to the chiropractor, Kimberly stated, "I think we’ve always understood that there's such rapid growth when a child is growing, and the birthing process — I don't ever say traumatic, but it can be dramatic," she said. "So it has always sat right with us to have someone who understands the vertebrae be able to take a look at little guys early on." 1. To maximize and increase their child’s brain and nerve development. 2. To enhance their child’s overall wellbeing. 3. To strengthen their immunity and reduce the incidence of colds, earaches, and general illness. 4. To help with colic/irritable bowel syndrome. 5. To help with asthma, breathing difficulties, and allergies. 8. To assist with behavioral disorders and offer greater emotional wellbeing. 9. To help alleviate bed-wetting and digestive problems. 10. To assist with sleep issues. 2 tbsp. cooking fat – ghee, coconut oil, bacon fat, etc. 1. Have your bacon cooked, drained, crumbled, and set aside. 2. In a large skillet or saucepan, add cooking fat and melt over medium heat. 3. Add diced sweet potatoes and stir to coat in fat, sprinkle with salt, then cover the pan and cook about 2 minutes. Uncover and stir again to brown evenly. Continue to cook 2-5 minutes until soft, adjusting the heat to avoid burning. 4. 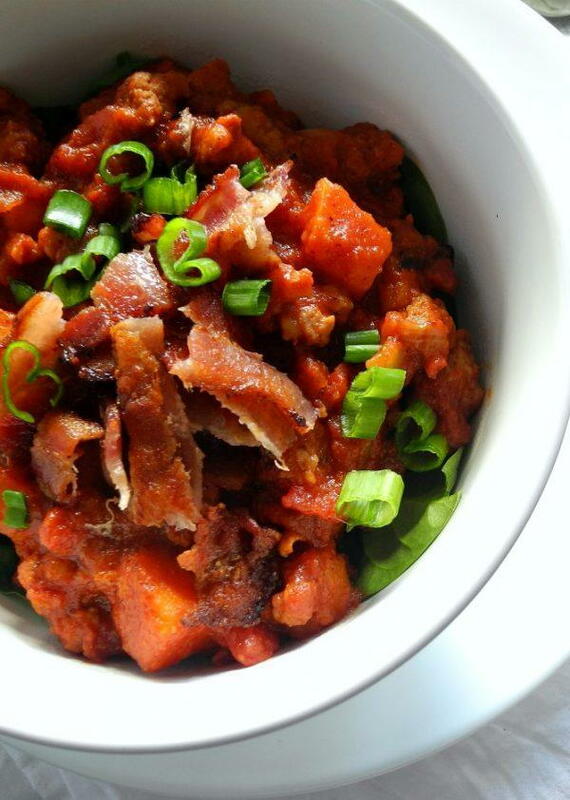 Once sweet potatoes are soft, add the diced onions and cook about a minute, stirring. 5. Next, add the chorizo to the pan, breaking up lumps and stirring with a wooden spoon. Cook and stir over medium heat until nicely browned. 6. 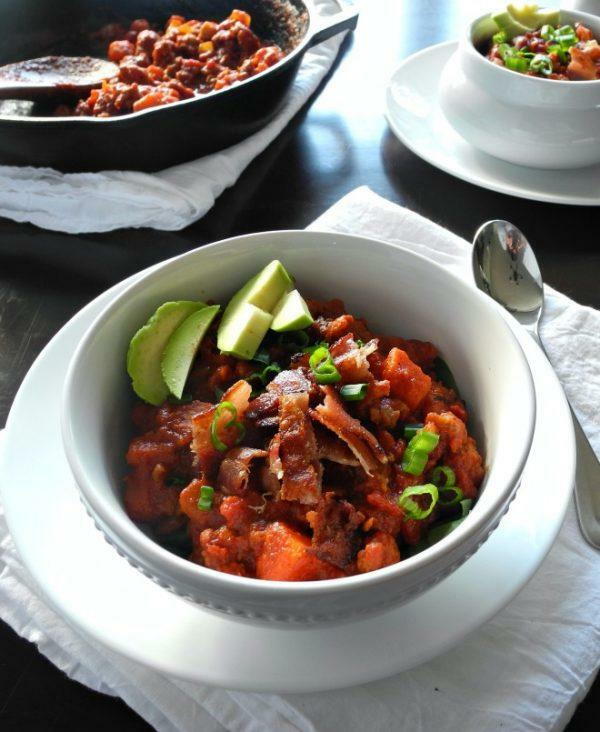 Once the sausage and sweet potato mixture is browned, add the crushed tomatoes, tomato sauce, and all the spices and stir to combine flavors. 7. Continue to cook and stir over medium heat until the mixture begins to bubble, then lower the heat and simmer for 5 minutes. 8. Once ready to serve, add the bacon to the chili. Serve over your favorite greens and garnish individual servings with sliced green onion and avocado.